There’s a rumour afoot that James Raffan was born in a canoe on the Speed River in in southwestern Ontario. As much as James would like to believe that, his mother has trouble with some of those details. Truth be told James, a first generation Canadian, son of a midwife and artist from the North of Scotland and a Yorkshire physician, was born in St. Joseph’s Hospital in Guelph, Ontario and was reborn in a canoe on the mighty Speed River, in the sense that his worldview changed the first time he paddled a real canoe, near his home on the edge of Riverside Park in Guelph. And from that moment on, the light of his lamp has been lit by self-propelled motion to discover and comprehend the length and breadth of the country that his parents chose over Australia and South Africa as a place to emigrate and start afresh following WWII. Singer/songwriter, fellow wilderness buff (& Air Canada Captain) Dave Hadfield, had this to say: James Raffan is that marvelous amalgam: the soul of a poet, the stage-presence of a born raconteur, and the painstaking accuracy of a professional historian. When he makes a presentation his photos captivate you, taking you to another time and place. He interweaves imagery, music, and storytelling in a way that is engaging, entertaining, and in a wonderful way quite educational. He has the relaxed stage presence of an experienced entertainer and leaves the audience always wanting one-more-story. (When you were a kid, he would have been your favourite uncle.) James’ artistic vision is very wide – he was the artistic director of the CanoeSongs 1 and 2 albums, which are iconic encapsulations of the Canadian North, as well as many books. His audiences always end up captured by The Lure of Faraway Places—one of his very own titles. Yet as a historian his works are resources of considerable value, much-quoted and recognized for their informed understanding of the Canadian North. An evening with James Raffan is one to treasure. You just might learn something, and you’re guaranteed to enjoy it. 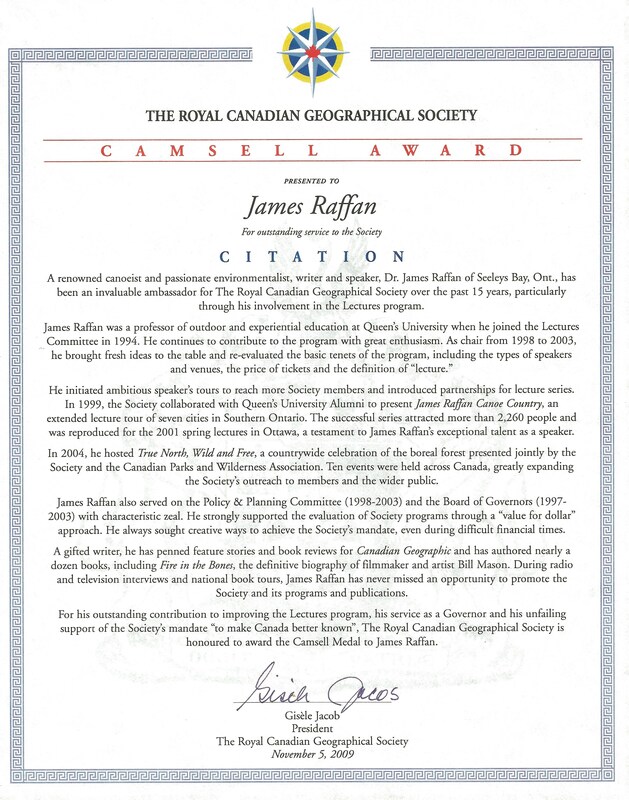 See more information (CV) for James Raffan—Geographer, Public Speaker, Paddler, Author, Adventurer. In 2012, James was inducted into the corral of Kickass Canadians. 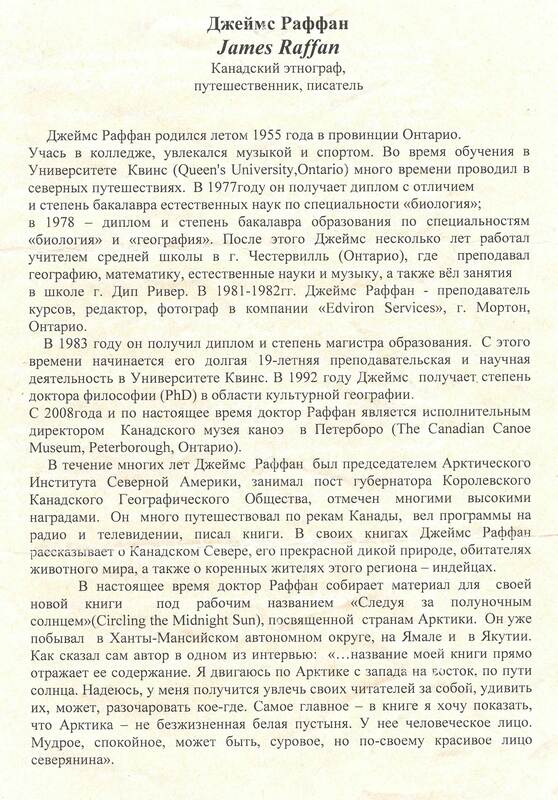 And here’s a copy of an introduction by Royal Ontario Museum Curator, Ken Lister, for a keynote address James gave at the York Club in Toronto. A reference letter from Geoff Green, Founder and CEO of Students on Ice. And here is a brief bio in Russian. 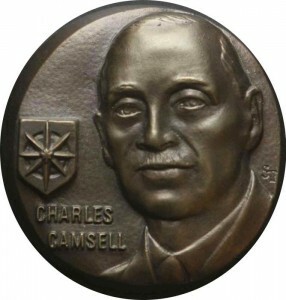 Click below to see Camsell Medal Citation.